Newspaper Recants 'Racist' Letter, Expresses Regret, as Outrage Erupts in British ColumbiaThe letter to the editor, penned by one Don Olsen, ran last week in the Nanaimo Daily News of British Columbia. Though taken offline almost immediately, it has engendered controversy for having been published in the first place. In a 15-item bulleted list, Olsen stated that aboriginals have spent the past 200 years “getting caught up to most of the rest of the world” and suggested they are not “responsible enough to look after themselves” and manage their money. First Nations immediately called out the newspaper. The day after the letter’s March 27 publication, Idle No More was out in force, with at least 100 people picketing the offices of the Nanaimo Daily News. They were joined by Nanaimo Mayor John Ruttan. Chiefs from the local to the national level voiced objections, one even vowing to suspend all dealings with the newspaper. By Alexis Van BemmelCANADA HAS SHOWN quite a racist attitude in its response to the Idle No More movement. Blatantly racist comments that I would certainly not expect in 2013 abound, such as “Indian giver,” “Playing victim…waiting for a handout,” and “This is Canada…the point is for everyone to have equal rights aka no special native rights…move on and get over it. You ain’t special. You are no different than any other Canadian even if you don’t want to call yourself one.” These feel like a slap in the face, and I’m a white Euro-Canadian. And then Don Olsen’s letter was published in the Nanaimo Daily News. I can sit idly by listening to this racist hatred no more. Canada prides itself on having created a tolerant and inclusive society, one where we accommodate diversity. We are internationally recognized for reconciling subnational identities; we have legislated and even constitutionalized our practices of accommodation. We like to believe that this is an important part of our history and a defining feature of our country, but is it really? Responses to the Idle No More movement suggest otherwise. These comments are based on negative stereotypes and misinformation that deprecate First Nations. The acceptance of them by the public only fosters conditions that allow the uninformed to discriminate further against First Nations. No other group in Canada is subject to these sorts of comments. With constructed superficial multiculturalism, we allow our selective memory to ignore our colonial legacy and current racial issues, imagining ourselves to be an accepting, tolerant nation, binding together all different peoples. We then question the position of First Nations, and spout that they should “join the rest of Canada” to be afforded the same rights and privileges as every other Canadian. By Danica DenommeThis article is a response to the letter to the editor published on March 27, 2013, by the Nanaimo Daily News, written by Don Olsen, which has since been removed from their website. An apology was issued by the newspaper after the racist letter sparked outrage and a protest. It was at least 16,500 years ago (according to ethnographers mapping genetic lineage) when the first peoples began moving from the Beringia into what we now know as Canada, and indigenous people know from our oral history that we have been here since the time period we call time immemorial. * Did not domesticate animals and use items such as chariots and machinery, instead intimately understood the various local living species and their interconnectedness, and took animals and other living creatures for nourishment and sacred purposes, letting the natural ecosystems thrive for millennia. * Have between 52 and 65 distinct language groups across Canada, with 32 different indigenous languages in British Columbia alone, and many more local dialects of these languages. Languages revitalization is taking place despite previous efforts to eradicate our language by doing things like physically abusing children who spoke their mother tongue in schools. * Used astronomy as a part of Traditional Ecological Knowledge, which is documented in oral history and many scholarly articles. * Have a complex and integrated way of learning, understanding, and teaching what is known as "science," including studies of geography, physics, botany, biology, mineralogy, geology, entomology (the study of insects), and ichthyology (the study of fish). * Used various forms of mathematics including geometry, visual-spatial relationships (more than simple arithmetic) in complex tasks such as estimating resources needed and designing and building longhouses. * Claimed to discover places where people already were. * Industrialized using a combination of dangerous engineering and child labour. * Relied on slavery for manual labour. * Invented apartheid and racism. * Became morally 200 years behind the rest of the world. * Have a history that is notable only for genocide. Are these people in trouble? Yes. Do they need help? Yes. Are they responsible enough to look after themselves and efficiently spend the billions they are given? Certainly not. The only way to fix this situation is to bring them into society as equals. They should be getting jobs and paying their share like the rest of us because in reality, they are no more special than any of the other hundred or more non-made up cultures that call Canada home.Comment: Really...the people who built complex edifices to mark astronomical milestones had no mathematics, science, or astronomy? I guess the ancient astronauts came down and gave the Maya a calendar more accurate than anything in Europe, eh? Denomme's and White People HQ's responses remind me of the essay I wrote in 1996 titled This Ain't No Party, This Ain't No Disco: A Columbus Day Rant. Check it out. One quibble with Denomme. Some Native cultures did invent the wheel, but it was useless without beasts of burden, which basically didn't exist in the Americas. That's the main reason for the lack of wagons and chariots, not some romantic oneness with nature. For more on the subject, see The Myth of Western Superiority. 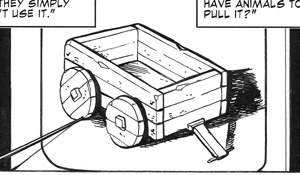 Below: An Inca toy wagon proves Natives understood the concept of the wheel. The "no written language" one is a lie. Basically it was developed by 19th-century anthropologists to explain why there were no records of the lost white race that blah blah blah. Even after hyperdiffusionism was discredited, they tended to place human habitation well within Flood geology, even though Flood geology had been discredited in the 18th century. No domestic animals is funny because plants and animals can't just randomly be picked for domestication; the British tried to domesticate the zebra in South Africa, with the predictable results of zebra-driven chariots working exactly five minutes, followed by wild zebra rampaging through Cape Town. In terms of wild plants, corn's the most counterintuitive plant, in that its wild ancestor looks nothing like the plant itself, and corn is completely dependent on humans just to survive; you won't find volunteer corn. (In fact, groups like Monsanto use corn as a counterexample to the "GMOs are unhealthy" crowd, though I assume retroviruses aren't quite the same thing.) Wheels, by the way, are typically used with domestic animals. The only other use I can think of (at least until the clockwork era, but especially the steam era) is toys (which the Mayans had) or rickshaws (which were iconic of class issues among Maoists). "Nothing that required hard manual labor" because slavery is soooooo awesome. Especially with "no mechanical devices". Does he even know what a "mechanical device" is? Because I'm pretty sure a bow or a snare qualifies as a mechanical device. No medical discoveries is funny, considering quinine. Heh, a white dude took quinine, had a bad reaction to it, and somehow became convinced magic water cured everything. Modern medicine is only about a century old, though. The funny thing about metallurgy is that a lot of metal came to Alaska via the Japanese current, and Eskimos used it. In Canada, you have the (surprisingly named) Copper Eskimo. Plus, gold was ubiquitous in ancient Mesoamerica. For musical instruments, there was a bow-like string instrument, plus of course a number of flutes. Nanaimo fails, um, engineering, medicine, history, astronomy, and what all else? Wheels aren't useless without beasts of burden. Ever hear of a ricksha, Rob? As Anon also mentioned. There are other factors to consider. Look at the setting for the Inca empire: terrain that made wheel use extremely difficult. Anon: You made some good points, but your confusion of astronomy with astrology was a big goof. I understand. What I was saying was that Indians had astronomy (as does anyone capable of looking up), but not astrology (which has the oddball nature of being a divination method that is in no way random). I doubt any culture has developed rickshaws without having the necessary infrastructure first. That would include beasts of burden, wheeled carts and wagons, and roads. As Wikipedia confirms, "Rickshaws were first seen in Japan around 1868, at the beginning of the Meiji Restoration. They soon became a popular mode of transportation since they were faster than the previously used palanquins (and human labor was considerably cheaper than the use of horses)." So no culture developed rickshaws in ancient times. I don't know the exact reason, but I suspect the development had something to do with a powerful ruling class and a surplus of human labor. The physical stress of bouncing and jostling may have been an issue also. Developing a practical rickshaw may have required metalworking and production skills achieved only in the Industrial Age. So I stand by my original comment. If no one developed rickshaws until 1868, it must be because they weren't a viable invention until then. Same with bicycles, scooters, and other wheeled vehicles powered by humans. They weren't viable until modern times.